See the smiling, congenial man on the left? He writes about serial killers. Specifically, he wrote I Hunt Killers, a book I absolutely loved, so it was great fun to attend a hilarious booksigning event last night. Barry Lyga discussed his dad’s reaction to the book (“Sick.”), his upcoming projects, and lots more. Please keep in mind that I’m paraphrasing most of the discussion, since I was so busy listening I forgot to take notes! I haven’t heard the narrator for the IHK audio book, but it’s hard to imagine he could do a better job than the author himself, whose deep, expressive voice was easy to listen to as he read excerpts from the book. It was especially scary to hear him use Billy Dent’s voice, which had a charming southern drawl. Barry said his girlfriend really doesn’t like it when he uses the voice on her, hah. 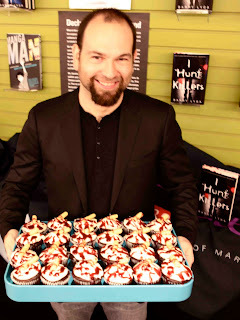 The creative people at Mysterious Galaxy, an awesome independent bookstore in Redondo Beach, made chocolate cupcakes with bloody fingers embedded in them for the event. Once you’ve read the book, you’ll know just how perfect this was. 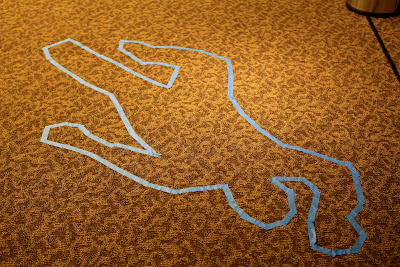 ;) They also created goody bags that looked like evidence bags and a dead body outline. All in all, it was a really fun evening and it was great to hear Barry speak about his book. Big congratulations to Sam over at Realm of Fiction, who won our Spring Suspense Bundle giveaway, which includes a copy of I Hunt Killers! And be sure to check out the blog stops for our mini tour for the book, with reviews by Bunbury in the Stacks, The Readventurer, Bending the Spine, and Sweet Tidbits (links to be updated when everyone has posted). If you haven’t picked up a copy of the book already, do be sure and check it out soon. I was very intrigued by I Hunt Killers. Not sure if enjoyed is the right verb to use after reading it, but I definitely want to read Game. Those cupcakes are amazing! Sounds like an great event. I loves this guy and I haven’t even read the book yet. Just imagine how much you’ll love the book, Zoe. ;) Hope you get a chance to read it soon! What Flannery said! I didn’t think that he meant this to be a series, and I am PUMPED that it will be! This event sounds wonderful, those cupcakes are deliciously disgusting looking. I love his point about serial killers being our boogeymen–it’s really true! Thrillers always scared me SO much more than horror because hey…it could really happen. Thanks for posting about the event, and linking, Wendy! I was thrilled to hear this would be a series too! And I’m with you, serial killers are much scarier than any fictional beast we could think of. :) So glad you were able to be part of the tour, Heidi, thanks again for participating. Ahhh! I love it. :D I LOVE the cupcakes and the body tape–so fitting, and very creative. I’ve been hearing nothing but awesome things about I Hunt Killers, so I cannot wait to get my hands on a copy. This sounds like an amazing event Wendy! Those cakes with fingers look so real! I don’t think I would have been able to stomach one! Did you manage to eat one? The cupcakes are oober fun for a book like this! Sounds like it was a fun book signing. The cupcakes were absolutely perfect. 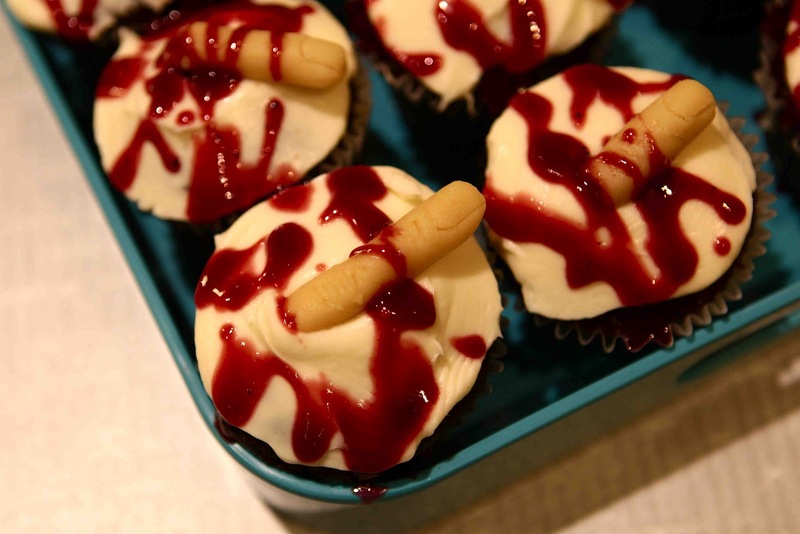 :) At one point, Barry was praising the cupcakes and saying how they were perfect because there were also severed fingers in his book. The woman who made them called out “The fingers on the cupcakes are edible!” and he replied, “Well, real fingers are edible, too.” And he smiled really, really big, hah. Lol, I might have some trouble eating those cupcakes. It sounds like this one was a really fun book event. I wish we had more of those up here. Oh, I had no trouble eating my cupcake at all. :D It was an awesome event, it’s going to be hard not to expect each one to be so outstanding! That sounds like so much fun! Too bad I missed it. I am going to read the book though. By the way, Wendy, are you going to the Gayle Forman + Stephanie Perkins signing at Children’s Book World later this month? Hope you enjoy the book, Maggie. :) I’m not sure about that signing you mentioned yet–I actually rarely go to to these–but that event definitely sounded great. And I do love that bookstore! It was a really fun event. Hope you enjoy the book, sweetie! Wendy, it looks like you had fun! This bookstore went above and beyond with this event with the cupcakes and goodie-evidence bags. I’m so glad you were able to go and share with us. It was a super fun event, Rachel, I’m sorry you missed it! But I’m sure being on vacation was worth it. ;) Look forward to hearing what you think of the book. I got this book at ALA with the evidence bag which is just so awesome! Hah hah, never trust a man with a tray full of fingers. Especially if he’s SMILING. What a great event! 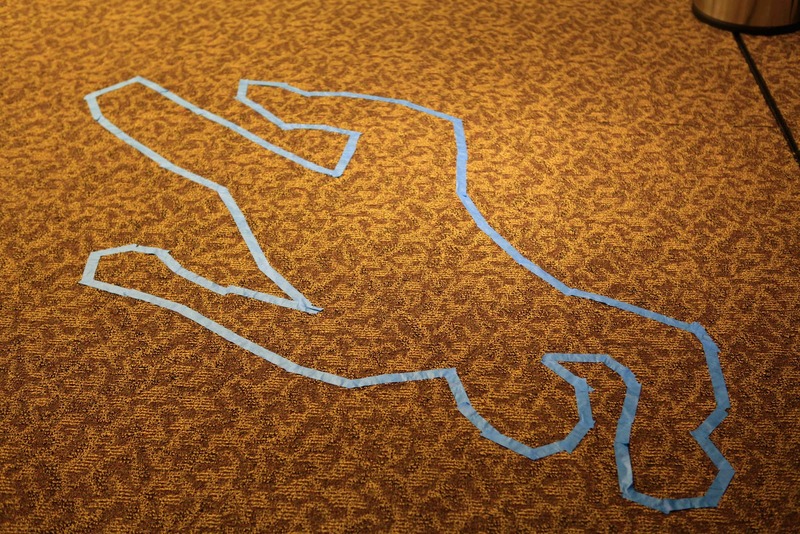 I’ve never been to an author event w/a theme. I’m sure it was great fun. I don’t think I would’ve been able to eat a cupcake. Those fingers! Glad you had such a nice time, Wendy! I hope you read this one soon, Heidi! It’s great for readers who love macabre humor mixed in with their gory thrillers, hah. Happy weekend to you, too! wow it’s impressive. the little cakes are amazing, well I don’t think I could eat them lol. It sounded like a great event, I didn’t know this one. So glad you won the giveaway, Sam–will get those books right out to you! Papercuts HURT! As does the idea of waiting so long for the sequels, hah. The cupcakes were absolutely delicious, Elena. :) I love it when stores go to the extra trouble to do something themed to the book. I actually did get a paper cut while finishing up the ARC of I Hunt Killers. There’s a little bloodstain and everything. I think it was Billy Dent trying to get out of the book. Hah hah, this is my favorite comment of the day, weebleny! Watch out or you’ll have an even bloodier book with the sequel. congrats Sam! and I haven’t heard of this book before. Thanks for bringing it to my attention. What are you doing to me with those yummy pictures wendy! Fantastic! Nothing like eating free cupcakes! That looks like raspberry frosting, my favorite! True, serial killers are scarier than vampires because they are real. Sounds like a fantastic event! NOTHING beats a free cupcake. ;) And yes, that actually is bloody raspberry syrup on top of the icing! It was a super fun night for sure. Really love the effort and the little details with the goodie bags and cupcakes. Wonder if Barry Lyga will narrate the audiobook? There’s a different narrator for this audiobook, Liyana, but I’m really hoping he reads the sequels. He has a great voice that’s really perfect for all the characters. Hope you get a chance to read this one soon! Thanks Noelle! It was a pretty blood-focused evening, hah. “Dastardly and delicious” sums it up nicely, Shortskie. ;) It really was a great event, and it was fun to see all the support for the author, too. There were some really hilarious librarians in attendance. Great recap – thanks for sharing! Sounds like such a fun book event with the author presentation, bloody cupcakes and evidence bags. I finally bought the book on kindle after reading yours and Flannery’s reviews. I will try to remember to read it in the daytime though because I’m scared already :) Didn’t realize it was going to be a tv show too! Oh, I can’t wait to hear what you think of this one, Lucy! I think a TV show has the potential to be really awesome, too. There’s no way they’ll be able to be as graphic, hah, but it’ll still be fun to see what they do with it. Their original store is in San Diego, Julie–I’m so glad they opened one up closer to me! I’ve been really impressed with the number of YA authors who have signed there. It was pretty awesome. :) Thanks Roro! Ok while the book sounds a bit bloody for me, I adore how this event went down. Fingers in cupcakes, evidence bags, and the taped out body. LOVE it. Thanks for sharing the fun with us. It was a really fun event, Juju! The author kept saying how awesome it was that the bookstore did all that. :) They’re definitely one of my favorite bookstores. Sounds like an awesome event! Man, you keep making me move this book back up to the top of my to-be-read-very-soon stack. The ARC I received also came in the evidence bag, which just upped the excitement factor for me. Oh, and those cupcakes are full of win. I can’t wait to see how that ties into the book! I keep nudging you to read it, hah, and I will keep nudging until it happens! 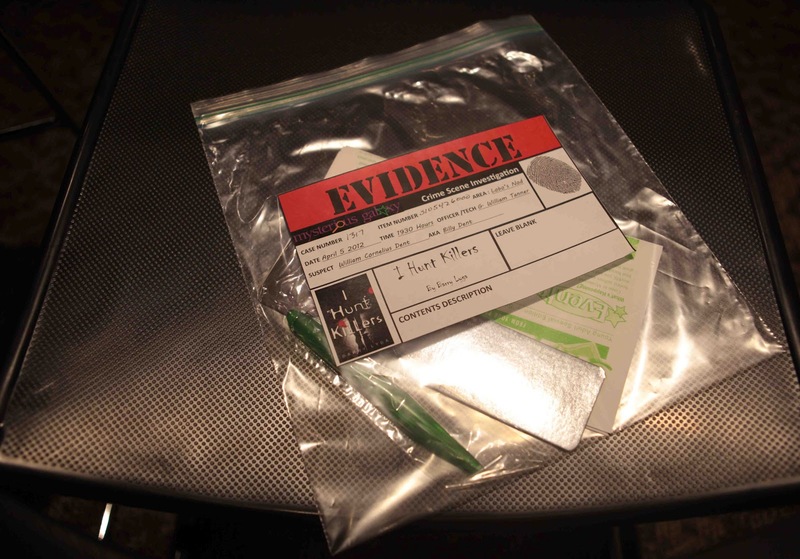 How fun that your ARC came in an evidence bag, that’s just perfect. I actually don’t go to many signings at all (I used to do too many of these when I worked for B&N way back in the day), but when I saw Barry was coming I couldn’t resist. I think we’re going to try to cover more author events, though, so hopefully it’ll still be fun to attend them vicariously through us!